Imagine if you had to tell your child they had cancer. How would you feel? For Matilda’s parents this nightmare became a reality. Thankfully, five years on, Matilda is happy and healthy – but many families are not so lucky. Your gift today could help fund vital research that will keep more families together, just like Matilda’s. Every day the parents of ten children and young people in the UK have to tell their child they have cancer – and it’s terrifying. During an eye check-up the optician found Matilda had raised pressure in her brain. Within two days of this routine eye test Matilda was in surgery to remove a tumour the size of a plum. As a result of the important research which had been done, Matilda’s surgery was a success. Please make a donation today to save the lives of more young cancer patients. Matilda’s mum Kaye Wragg is best known for playing Essie Harrison in Holby City. 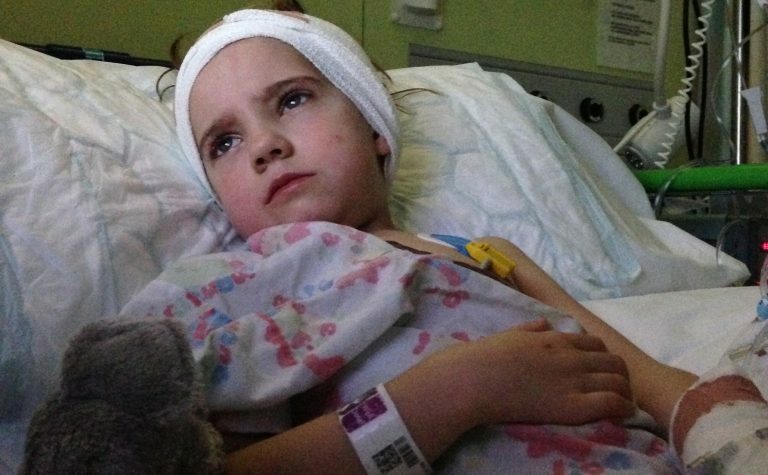 Kaye shares her daughter’s story of how Matilda was diagnosed with a brain tumour aged 5.